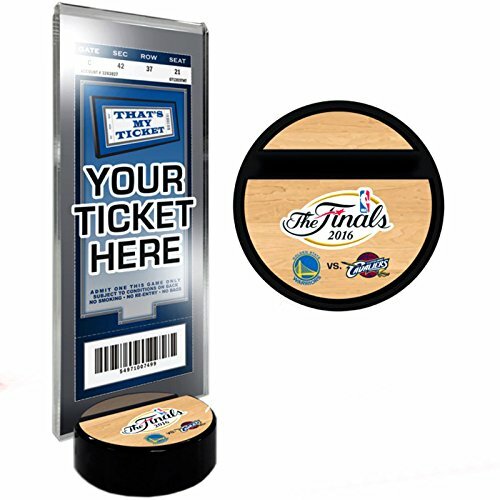 Capture the memory of attending the 2016 NBA Finals with a Ticket Stand. Display your ticket in this 3/8-inch thick clear-acrylic holder along with the black round stylish base which features the 2016 NBA Finals logo along with the participating team logos. Displays tickets measuring up to 3 1/2 x 7 3/4. Holder can be placed on the base horizontally or vertically. Base measures 3 round x 1 thick. Acrylic holder measures 3 1/2 x 8 1/2 x 3/8. Officially licensed by the NBA. If you have any questions about this product by That's My Ticket, contact us by completing and submitting the form below. If you are looking for a specif part number, please include it with your message.